And It's A... COMPLETED GAME!!! *sigh* …What have I gotten myself into… I mean…sure, at the time playing this game seemed like such a good idea – I mean a really good idea. I love Final Fantasy, so that must mean that this game is okay, right? I mean, I even managed to get through the incredibly mind-blogging-I-need-a-beer-so-very-badly story! That was something, right? I even managed to tolerate the fact that I had to play this game twice because of a game breaking bug that I just found at the last possible second. I mean, that’s okay, RIGHT!?!?!? 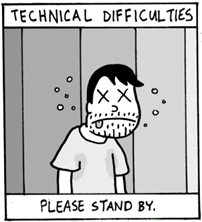 But then again, the glitches…the cosplay…the ever-growing number of Final Fantasy characters…!!! It’s just something that no man shouldn’t have to bare - SHOULDN’T BARE I TELL YOU!!! BRAGHHHHHHHHHH!!! *pant* *pant* *pant* *drinks a glass of water* Ah…! Oh yeah, that hit the spot. Huh? What? 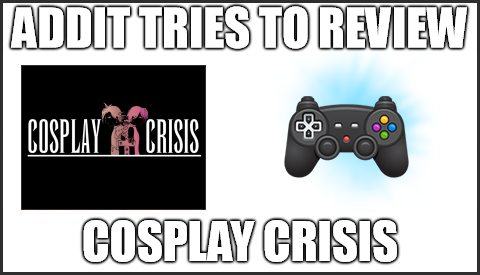 “Cosplay Crisis Review?” Oh no…OH NO!!! I just love how subtle this game is. Kumo…Atsure…ki…Atsureki (okay…) along with his two bestest friends in the whole wide world, Levi Raiono…Levi Raionomoi (seriously!?) and Miri Jouma…Jouma…Joumaeshin (okay, seriously – WHO WAS IN CHARGE WITH NAMING THESE PEOPLE!?!?!?) absolutely love Cosplay, not to mention that they have massive man crushes with the Final Fantasy games. (You know, before they started sucking, the good ones? Yeah, “those” ones.) 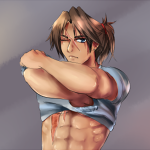 Anywhooooo…while dreaming in his bed about trying to tie a sock in Squall’s, oops, I mean Levi’s mouth for reasons I wouldn’t possibly know, Kumo suddenly is awoken by his friend, Miri, and soon receives a call from his other bestest bud in regards to undertaking a mission to blow up The Ominax Reactor 5, hmmm…just like in the games!!! 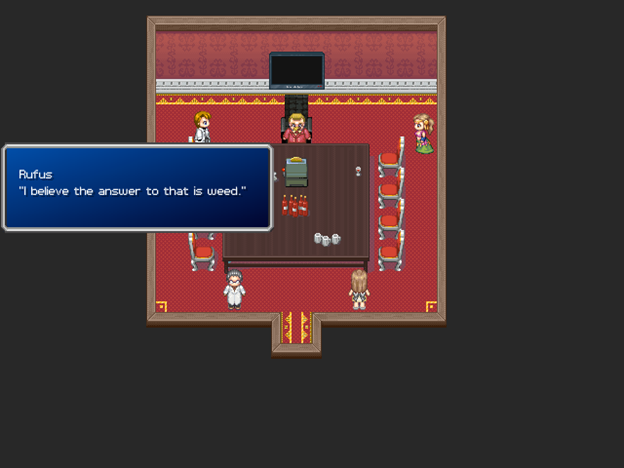 The only problem is, Kumo doesn’t remember anything about undertaking this mission of any kind (drugs?) but decides to go anyways. While teaming up with team LANDSLIDE on this assignment (get it? Landslide. Avalanche), the pair manages to sneak in and complete their objective but not while going through a whole mountain’s worth of trouble to do so. But that’s when things begin to go astray. In what appeared to be a simple mission of blowing up junk begins a chain reaction of events that begin to sway into motion. Suddenly, things don’t appear the same, people begin to act rather…strangely and the fate of the entire world hangs in the balance. It will be up to Kumo and his friends to stop the Ominax Corporation along with the terrible C-Virus that looms in the air along with foiling some familiar schemes from some familiar foes. I’m sorry about all that. It’s just…man, the potential in an idea like this wasted…over something…like this!? Look, I understand that SorceressKyrsty tried her best to make sure the story fits and all – and, look, it probably does make a little bit of sense if you piece everything together – but I just couldn’t get it. The story is so hard and unbelievably complex, you’re better off just playing the actual games that this is based off of – at least that make sense (then again, FF8, and it’s plot…). If there is one saving grace with the whole plot is the dialogue. 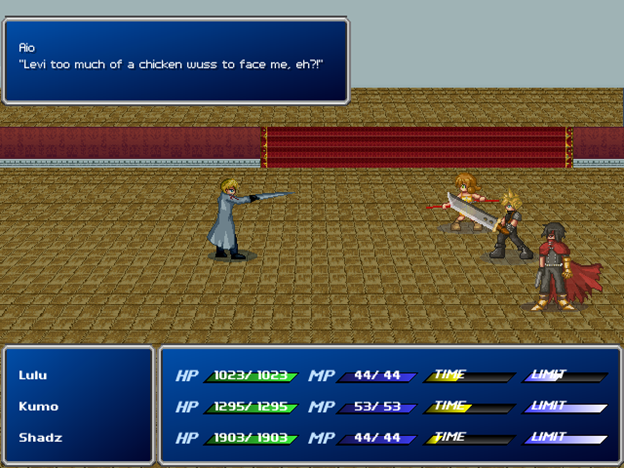 While some of the lines are blatantly borrowed from various movie quotes that shouldn’t really fit, some of the lines that involve the characters talking to each other and various NPC’s can actually be quite funny, especially if you’ve played any of the games. I felt that was a bit of a nice touch when a bit of comedy is used right. But on the downside of that, in the games, Cloud, Squall, and Vincent never really said much and didn’t really have much of a personality in those games. To see their cosplay counterparts do the complete opposite and talk to everybody and everything they see is a bit strange to me and out of character. Anyways, it’s a shame that this idea could have been put to better use. I would have liked it more if she did something like this – and it’s just my two cents: Basically, the characters start the game off by going to a Final Fantasy convention being big fans of the games. They dawn their clothes; they go to the convention. Then, while being at the convention they get sucked into the worlds of FF7, FF8, and FF9. 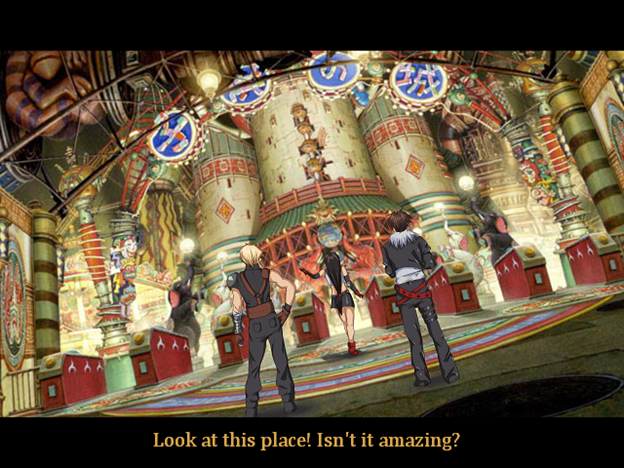 While being sucked in separately, the trio of teams eventually find a way back to the real world after completing some of the objectives like in the games. When they escape, they find that the villains of the series have made their way into the real world and that the characters must save all the three worlds – and theirs - before encountering the mastermind behind it all. That’s would have been a lot easier plot-wise to follow. You could have them going into the separate games and meeting familiar characters while establishing your own with the cosplayers that play on those roles. You could even have a simple, but deep character development with the party in the real world, like their home life, school, jobs, parents, boyfriends and girlfriends - anything. Either way, I’m not the one in charge of the storyline, Kyrsty is. From the way it stands, the plot can be explained in two words or less: X-Zone. Okay, I have to admit: THIS PART IS SO F**KING COOL!!! Since Cosplay Crisis is basically a love letter to the Playstation Final Fantasy games of the late 90’s, you can expect similar gameplay traits to go along with it, more so with Final Fantasy 7’s system more than any of the other games. 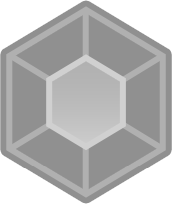 Like in FF7, you fight enemies to level up both you and your characters, use Materia, which are basically magic-like orbs that grant you various skills and spells that you can assign to your weapons and armor, and use limit breaks when the time is right. Unlike FF7’s Limit Breaks, when your limit fills up to maximum, you basically can use it whenever you wish instead of just using it on the spot. You can also learn new Limit Breaks during the course of the game. 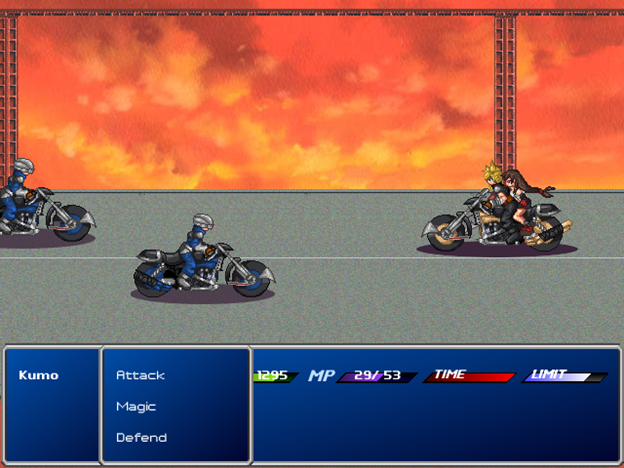 The battle system works just fine just like it was in Final Fantasy 7. It’s a bit of a shame that Kyrsty couldn’t use more similar gameplay traits, like in FF8 with its Junction System and FF9 with its abilities and make it into some sort of a combo, but I guess it just a minor nitpick. I do have two complaints with the battles in this game: Number one, I found that the enemies attack power was WAYYYYYYY too high, like in Final Fantasy: The After Years sort of high. These enemies, including the earlier ones and bosses did a TON of damage of you and that kind of irks a little about that. It’s pretty much just the opening enemies that bother me as when you get a bit father into the game they aren’t too bad, but still it’s bad balancing. The first group of enemies should be generally easy on a player to get them accustomed to the game, not three good hits and you’re DEAD!!! Shame. I also didn’t like the fact that some battles didn’t yield as much EXP and GIL for your troubles, which was also a problem when it came to minor grinding (even though you don’t need to that much in this game). Still, the battles in the game are quite enjoyable; very impressive. I really like how it captures the spirit of the classic games to a tee, even going as far as referencing certain elements from the games in the best way they can. Although some of the bosses gave me some trouble, I guiltily welcomed a bit of a challenge. There are some bugs to be found in the system, but not as troubling as the rest of the game. Well done. Yeah… He had to pull a “Luongo” there for a second. Do you like Final Fantasy music? You do? Well then this shouldn’t be a problem for you. Personally, I have mixed emotions with Final Fantasy’s music. Not that I hate it, but some of the tracks do drive me a bit nuts in certain departments and a lot of that music in this game sure reminded of that sentiment. Okay, that’s not entirely Kyrsty’s fault, considering it IS a Final Fantasy game. Still, let’s get the goods out of the way. The greatest feature about the soundtrack, in my opinion, is the option to choose what battle / boss theme from FF7, FF8, or 9 that you want to listen to in battle. That’s a nice touch. I wish you could have the option to change it back, but whatever. I was a bit disappointed that you couldn’t also choose the rest of the themes from those games for, like, towns, dungeons, etc.. I know that a lot of tunes from FF9 wouldn’t really match the setting in some locations – but she could have done it. On the subject, this game also uses a few remixes (which sound great, BTW) and midi’s as well. I personally didn’t really find the sound quality great with some of the midi’s, but it saves memory space, so I guess that’s fine. Overall, the soundtrack is…well…um…classic Final Fantasy tunes. I personally have mixed feeling with Final Fantasy music, but it fits for the game, so I guess that’s fine. Graphically speaking, this is the part of the game that really shines…well, at least in most of the department. First off, the battle sprites and portraits are AMAZING, real top notch work. 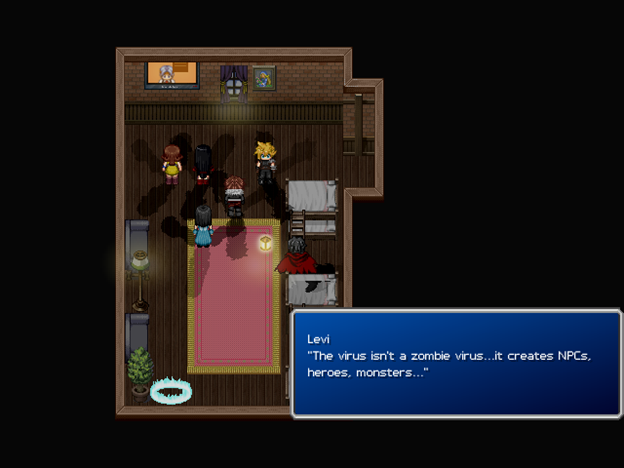 There is a level of detail and quality that I don’t see in most fan games but Kyrsty did an amazing job with the presentation of it all. Great, great stuff. I also liked a lot of the CG cutscenes that were placed in the game (like the shot above); it really adds a level of atmosphere to the game and really delivers that sense of quality. Judging by this, this seems to be her strongest attribute (almost similar to ANOTHER female artist / game guru that I know). However, not all is good in candy apple island. The mapping seriously needs some fine tuning. There were a lot of instances that my character could melt into the staircases or other doohickeys along the way while I was playing. I also had a lot of trouble with misguided sprites popping into place during certain points of the game and found shops hard to access with no indications of which building they are located in. It’s like…why couldn’t the maps be of the same level of quality as the rest of the game? Overall, it’s a split package in the end. The maps aren’t ALL bad, but they do bring the score down a little. There is no doubt in my mind that Cosplay Crisis is a good attempt at a fan game in a series of an otherwise disappointed fan game pool over the course of time, but I actually was a bit conflicted with this one. On the one side, you have a game with the potential of an amazing concept with a great artistic vision which replicates the spirit of its source material in a positive way where you have the other side of the coin which is littered with inconsistent plot holes, bugs, and just a messy polish to everything. I want to like this game, but I can’t in its current state. For it seems that everytime I start up this game, I’m always greeted to some new bug or new thing that just pisses me off to the point where I weep a little inside. Is Cosplay Crisis a good game? Well…yeah, I guess so. Is Cosplay Crisis a great game? By no means. If SorceressKrysty ever manages to polish some of the mapping, fix all the minor and major bugs and balancing issues, and weed out some of the dialogue to make things a little bit more clear this game could be a great game. If you’re a fan of the Final Fantasy series, you SHOULD definitely check this one out. If you’re not a fan of the series, then my advice is to just stay away from it and play something else that won’t hurt your brain. Kyrsty, you got some mad skillz in the artistic department. Now all you have to do is work on the rest. I look forward to your next game…even it is another Final Fantasy game starring a certain gunblade wielding maniac. 2.5 / 5 - C- ~ Passes, But Just Barely. Thank you very much for the review! I agree on all your points, but I most likely won't be finishing the revisions I was doing for this game; it was too extensive and was taking me far too long to do. It's basically my first game, since it's the first game I took seriously and completed and it really, really, really shows. I'm satisfied at the very least that it does get pass grades and is enjoyable on some level, especially gameplay-wise; what's a game if the gameplay isn't enjoyable? And for the record the next game I'll probably be releasing in a complete form most likely won't be staring the gunblade wielding maniac...maybe. Buuuut it's something I keep in mind and try to mitigate in my other games since, so all in all this game was a (albeit long) learning experience. Hey, for a first time project this game pwns a lot of first time projects, so you should be awfully proud of yourself. And for a Final Fantasy fan-game, it's one of the best I've ever played on the site; it felt like I was "actually" playing a Final Fantasy game released by Square-Enix. I trust you've learned a lot from making this game regarding the bewildering story and coding parts, so I guess your next projects will be an overall improvement from this in a lot of ways. And it's okay about the bugs. :) Some of them were actually quite funny. You should have seen my face when I found out about the Ragnarok glitch for the first time.